London is a major world city and capital of the United Kingdom. It is located about 360km west of Amsterdam over the North Sea. London-Amsterdam is a popular travel route attracting over 4 million passengers per year. Let’s look at the options for travel between Amsterdam and London by train, air, bus and ferry. Travelling between Amsterdam and London by rail is a certainly viable option. 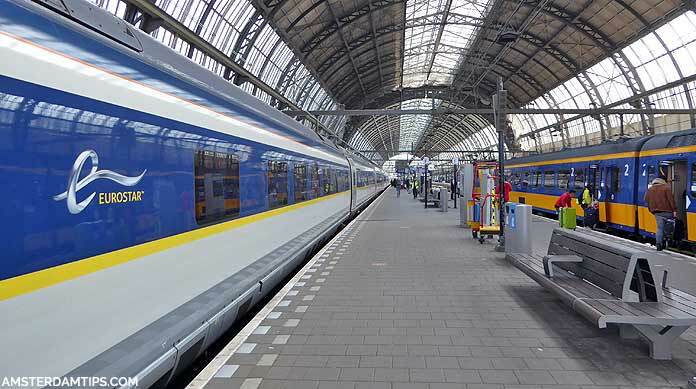 There is a direct London-Amsterdam Eurostar train service (3 hours 41 minutes) running which stops in Brussels Zuid/Midi and Rotterdam. This service runs twice daily during weekdays and once daily at the weekend. It departs from London St Pancras Mon-Fri at 0831 and 1731, arriving at Amsterdam Central station at 1312 and 2212, respectively. At weekends the 0831 service runs on Saturday, the 1731 service runs on Sunday. Note, the returning Amsterdam-London Eurostar currently cannot offer a through-service. Passengers need to get out at Brussels for security and immigration controls and then wait for the next Brussels-London Eurostar. The Amsterdam-London direct service should be running by the end of 2019 – this will require special screening areas at Amsterdam and Rotterdam plus new staff and agreements between British and Dutch authorities. (1) The trip from Amsterdam to Brussels which can be made using the high speed Thalys service which runs from Amsterdam Central to Brussels Zuid/Midi via Schiphol, Rotterdam and Antwerp. This runs 14x daily and takes just under 2 hours. There are also the above mentioned London-bound Eurostar trains running Brussels-Amsterdam. Alternatively, Amsterdam-Brussels can be made by the slower Intercity Brussels (13x daily) which runs hourly between Amsterdam and Brussels Zuid/Midi. This journey takes 2 hours 48 minutes. (2) The Brussels-London part of the journey is made by high speed Eurostar trains running 6-7x daily via Lille and the Channel Tunnel. This trip takes 2 hours though you need a little extra time beforehand to check-in and go through security and border checks. Classes of travel on Thalys are Standard (2nd class), Comfort (1st class seat only, no food/drinks) and Premium (1st class seat with food/drinks served). All seats have individual electric power outlets. Intercity trains have 1st class and 2nd class carriages. The Intercity Brussels trains often have an attendant passing through the train selling drinks and snacks. Eurostar has 3 main classes of travel: Standard (2nd class), Standard Premier (1st class ‘lite’) and Business Premier (1st class). Standard Premier passengers get roomier seating, drinks and a light meal served at their seat plus a selection of magazines. Business Premier ticket holders get a full meal and drinks, newspapers and magazines as well as Eurostar lounge access. Standard passengers can buy refreshments at the onboard bar buffet car. Eurostar offers onboard WiFi only on its new and refurbished trains, all trains should have it by 2019. Power outlets are available at each seat of the newer trains. London-Amsterdam one-way fares cost from £35 (Standard), £79 (Standard Premier) and £260 (Business Premier). The cheapest fares tend to be the direct train service; the Eurostar+Thalys through-fares are normally more expensive. Eurostar’s UK site currently does not sell tickets for Intercity trains to Netherlands or to any Dutch station. Booking from the Netherlands, the cheapest Amsterdam-London one-way fares are available from €40. The London-any Dutch station one-way fare starts at €59 (Standard) or €99.50 (Standard Premier). When travelling Amsterdam to London do allow enough time for checking in/border control/security at the Eurostar terminal in Brussels. We suggest arriving at least 45-60 minutes beforehand if possible. The journey times for London-Amsterdam for Eurostar+Thalys is about 4 hours 30 minutes; by Eurostar+Intercity Brussels it is about 5 hours 30 minutes. For more info see our international trains from Amsterdam article. Amsterdam-London is a very popular air route with flights operating between Amsterdam Schiphol (AMS) and 6 airports around London – Heathrow (LHR), Gatwick (LGW), City (LCY), Luton (LTN), Stansted (STN) and Southend (SEN). Flying time generally takes between 45 and 60 minutes although flights into London Heathrow can be delayed slightly by the management of air traffic into rotating stacks. As the UK is not part of the European Schengen border agreement you will need to go through passport control at both sides. UK-Netherlands air passengers will also need to submit “advance passenger information” to the airline prior to travel. 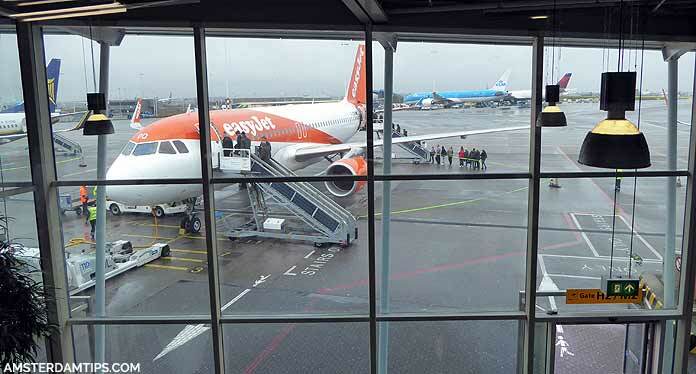 No frills heavyweight Easyjet connects Schiphol to London Luton (up to 6x daily), Gatwick (8x daily), Southend (2x daily) and Stansted (4x daily) using Airbus A319/A320 aircraft. Return prices start at about £80/€95 when including checked luggage. At Amsterdam Schiphol, Easyjet check-in desks are located at Departures Hall 3 – usually queues are not too bad except for peak times – and flights depart from budget pier H.
British Airways (Oneworld alliance) flies from Amsterdam to London Heathrow (8x daily), London Gatwick (3x daily) and London City airport (5x daily) with a reduced schedule at weekends. Aircraft used are mainly Airbus A319/320/321; smaller Embraer aircraft are used on the BA Cityflyer service from London City. BA flight prices can be a little more expensive than Easyjet and the service is more geared to business passengers or those with onward connections. BA has its own Galleries lounge at Schiphol, as well as multiple lounges at London Heathrow and Gatwick. Return economy prices are from approximately £85/€100 – the very cheapest fares being the hand-luggage-only fares to/from Gatwick. BA also sells more expensive Club Europe (business class) tickets on the London-Amsterdam route. Flights departing Amsterdam leave from the D gates. Note, BA Cityflier flies to Rotterdam airport from London City up to 4x daily. KLM (Skyteam alliance) is the national Dutch carrier although these days owned by Air France. It flies to London Heathrow up to 11x daily. KLM uses Boeing 737s on the route and smaller Embraer planes for its Cityhopper branded service. KLM Cityhopper flies from Amsterdam to London City airport up to 6x daily. Prices can be a bit more expensive than Easyjet and BA – expect to pay from about £120/€140 return if checking in luggage. One-way flights with KLM can be very expensive. KLM caters for its frequent flyers with its Crown lounges at Schiphol. KLM should be noted for having an excellent network from Amsterdam to all over the UK. No-frills airline Vueling operates 2x daily between Amsterdam and London Luton using Airbus A320 aircraft. Return fares start from around €65 excluding any optional extras. Flybe flies daily between Amsterdam and London City using a Dash 8 aircraft. Note, Ryanair flies from London Stansted to Eindhoven airport, 90 minutes south of Amsterdam. It currently only serves Dublin from Amsterdam Schiphol. Eurolines runs an international coach service between London Victoria and its Amsterdam Duivendrecht terminal. There are 2-4 daily services (depending on season) to Amsterdam – both night and daytime services – and the journey takes around 11 hours with various stops at Dutch and Belgian cities. Singles between London and Amsterdam with Eurolines start from around €22. OUIBUS is a premium coach service run by French Railways (SNCF). It operates a 2x daily service between Amsterdam Sloterdijk and London Victoria – prices start at £22/€25 one-way. Ouibus is now the official European partner of National Express coaches. Flixbus also operates a 2x daily coach service from Amsterdam Sloterdijk to London Victoria with fares from €25 one-way. The Dutchflyer rail-ferry option is available from Stena Line ferries in conjunction with Greater Anglia (GA) and NS Dutch railways. The ferry runs 2x daily (1 day + 1 overnight sailing) between Hoek van Holland (Hook of Holland, near Rotterdam) and Harwich. 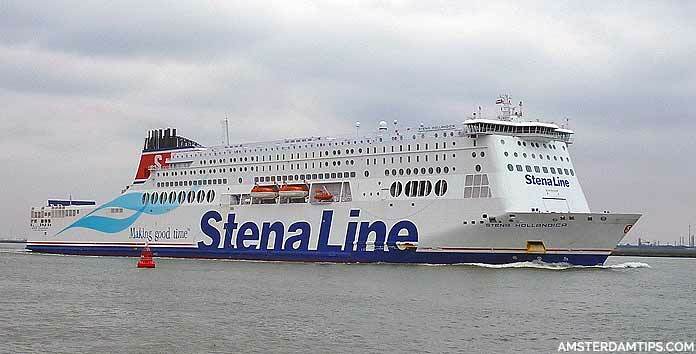 The special Stena ships operating on this North Sea route are the 240m long Stena Hollandica and Stena Britannica and the sailing takes 6 1/2 to 7 hours. There are various ticket options available. From the UK, the Rail & Sail Harwich to any Dutch station costs from £55 one-way; from any GA station to any Dutch station costs from £49. Overnight sailings require a compulsory cabin – cabin fees range from £34 to £130. Cabins cost half-price for day sailings. Buying from the Netherlands, the journey from Hoek van Holland to any GA station costs from €49 (day) and €76 (overnight). A ticket from any station in the Netherlands to any GA station costs from €66 (day) and €93 (overnight). GA stations include London Liverpool Street, Norwich and Cambridge. Note that rail transport on the Dutch side from Hoek van Holland is changing. The NS train line has closed and replacement bus services run between Hoek and Schiedam. From Schiedam you can connect to the Dutch rail network. From around April 2019 a new metro line will open from Hoek to Schiedam.